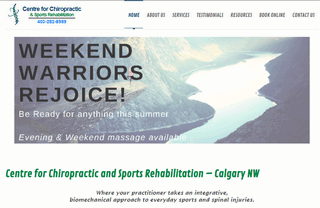 At Calgary’s Centre for Chiropractic and Sports Rehabilitation you have the option of seeing one (or all of) the five practitioners for your musculoskeletal condition; three chiropractors (two male and one female) and two registered massage therapists round out the treatment team. We also provide stretching and self-maintenance to aid in your rehabilitation. Stretching and Mobility classes are held on Thursdays.